Bring the hunt indoors! 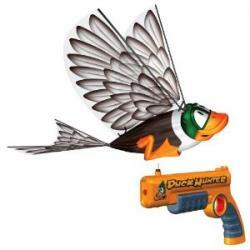 Electronic iFly RC Duck Hunter,! Let your imagination take flight! Charge up, toss and take aim... 3 shots on target make you a winner. Of course, after a quick charge he's ready to take flight for another round. Practice makes perfect and this RC Duck Hunter brings an easy, regular practice routine home. A fun toy for the office. And a great way to get your little ones in the right frame of mind for next season. Now available here for LESS! Wow: Duck target adjusts to provide both straight and circular flight patterns; Wings flap, tail stabilizes flight; Realistic shotgun sound effects; Electronic gun is also the charger, duck right up for more flying fun; Charger uses 3 AAA batteries (not included). Gun is 9 1/4 x 5 1/2"h. Bird is 9 x 2 1/4", with a 12" wing span. Weighs 6 ozs. Recommended for ages 10 and up. Order yours today! CHOKING HAZARD. Item contains a small parts.Not for children under 3 yrs. iFly RC Duck Hunter.